Months of organizing and community building held the alt-right to tiny turnouts and shortened programs in city after city. They didn't show up in Charlottesville at all except for a sighting of 20 Proud Boys well away from the 2011 Unite the Right site days earlier on the 9th of August. That might have been nothing more than recon for a failed attempt to show up in Cville on August 11. The 400 people expected for Unite the Right II, the centerpiece of the entire right-wing offensive turned out to be maybe as few as twenty fascists. It was claimed that up to 300 more refused to show up because they were afraid of the community. Internal division may have played a role too however, maybe "Divide the Right" should have been the name for Aug 12. 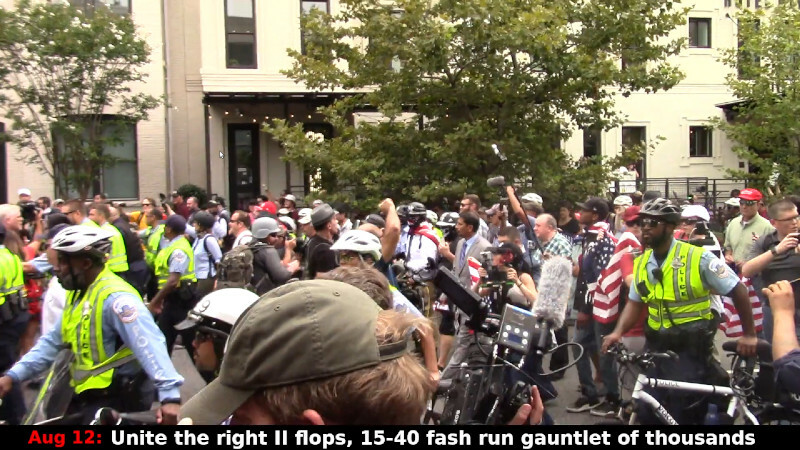 Each time the alt-right showed up, they had a tiny showing and were utterly dependent on huge numbers of police fighting on their side to hold back thousands of counterprotesters. More than once they gave up early, and in DC they wanted out when it started raining, only to find they could not get out the way they came in. In the wake of "Unite the Right II," (Aug 12 in DC), the General Manager of DC's WMATA transit agency found himself under fire from ATU Local 689 (Metro's union) for going back on his word and giving the Nazis a special train. Without that train, the Nazis would never have reached DC at all, as their bus driver refused to show up. Capping all of this was the toppling of the "Silent Sam" Confederate statue at UNC in North Carolina.